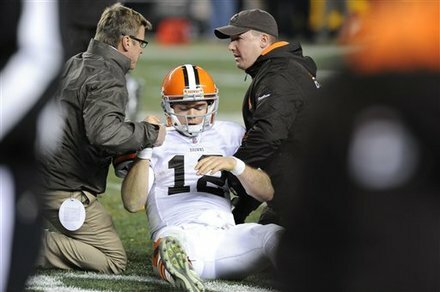 NFL Players Association executive director DeMaurice Smith sent union representatives to Cleveland on Monday to gather more information related to the treatment of Browns quarterback Colt McCoy, according to Adam Schefter of ESPN citing a league source. The Browns’ coaching and medical staffs have come under fire for the way they handled the treatment of McCoy following the concussion he sustained during Thursday night’s game against the Pittsburgh Steelers. Under the CBA, the union has the ability to make unannounced visits to team facilities to review health and safety protocols and can consider grievances against clubs based on the findings. Members of the NFLPA’s executive committee and Browns players are at odds over what the union should proceed. Scott Fujita, a member of the committee, has publicly called for independent neurologists on the sideline. However, according to sources, Charlie Batch, also a member of the committee and teammate of James Harrison, whose hit caused the concussion, has remained silent on the matter. Also, according to sources, while Fujita has been outspoken in his criticism of the system, Browns union representative Tony Pashos and other Browns players believe the team is not at fault for the incident and the blame falls squarely on the union. Another member of the union’s executive committee, Sean Morey, resigned from the NFLPA’s Mackey-White Concussion and Traumatic Brain Injury Committee, citing a lack of action on the union’s part regarding concussion-related issues.